Places that might help with foster, adoption, etc. Offers low cost surgeries at the animal shelter for all county residents either at the shelter or through the Neuter Commuter. Call the Neuter Commuter to schedule all appointments. 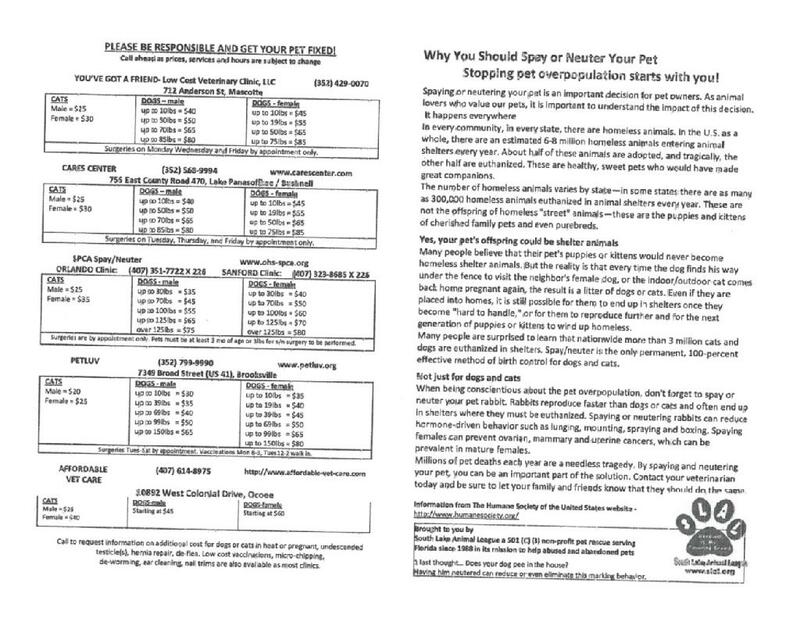 Certificates are available for purchase at the shelter and may be redeemed at local participating Veterinarian offices with no additional cost for the alteration procedure. Low cost spay and neuter clinic. Offers the Big Fix low-cost spay/neuter clinic for companion pets only at their shelter. Must be a resident of Sumter County to participate in the program. 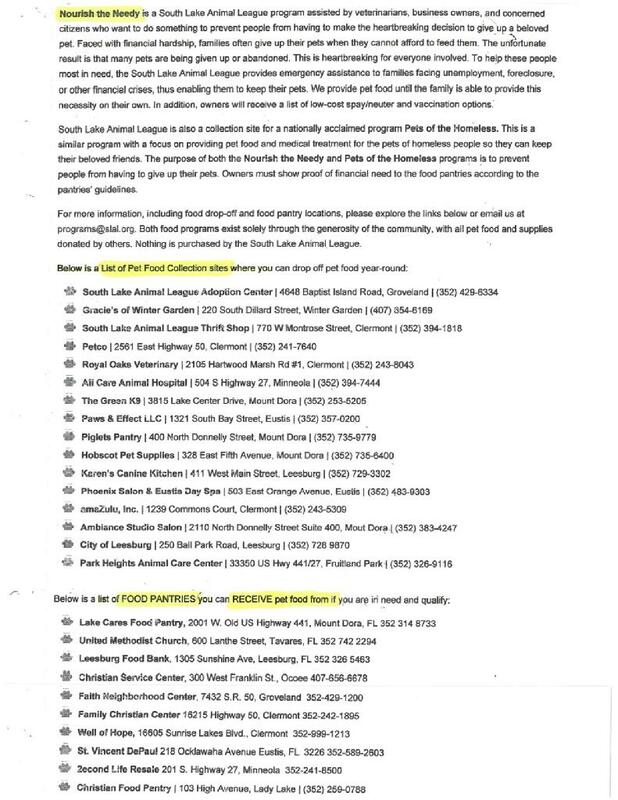 No cost spay/neuters are provided to feral colony caregivers in Marion County as part of their Community Cats Program. Caregivers must register with the organization and attend at least one feral cat workshop annually. Spay/Neuter Surgeries are scheduled every Tuesday & Friday by appointment only. - Neuter a male cat is $25; a female cat spay is $30. - Dog neuter starts at $40; a dog spay starts at $45 and goes up according to weight. Walk-In Shot Clinic every Tuesday, Thursday & Friday from 10AM - 2:30PM. No appointment necessary for shot clinic and no office charge! They work in conjunction with Orange County Animal Services to offer free spay/neuter and vaccines for feral and abandoned cats in Orange County. Call them for complete and current information and to make an appointment. They offer two low-cost programs for county residents. They have a clinic at the shelter and a mobile clinic as well. They also offer free surgical services to qualified low-income residents. They have low-cost spay/neuter clinics at both shelter locations. Please check their website for each clinic’s operating schedules. Cash and most credit cards accepted. - Cats and dogs must be in reasonable good health. Kittens must be at least 2 ½ lbs. Kittens under 12 weeks will not receive a rabies vaccine. - NO food after midnight the night before surgery. Remove all food dishes by midnight the evening before. - Feral cats must be in a humane trap. - Dogs must be on leash. - Each cat needs to be in their own carrier or humane trap and a towel needs to be in each carrier. You may bring a towel to put in the trap after surgery. No litter boxes or bowls in carriers or traps, please. NO REFERRAL FROM CARE IS NEEDED WHEN CAREGIVER PAYS. If caregiver is paying they must speak with Colleen and tell them they are with CARE to receive rescue discount. CATS CAN BE FERAL (Must be in a trap) OR FRIENDLY RESCUES – Pricing: $27.50 Combo Test, $9.50 Feline Leukemia Vaccine, $2.50 Ear Tip (Preg = $74 as per all info provided here) Kittens - will fix females at 3lbs. Will neuter at 2lbs. Pricing: $49 Neuter or Spay (including pregnant or in heat), FVRCP, Rabies, Ear Tip included in price. Drop Off: 7:30 They will call you to pick up – CATS MUST BE FERAL AND IN TRAP NO REFERRAL IS NECESSARY - MENTION CARE & FERAL PACKAGE - NO fax authorization required from CARE. Pricing: Caregiver Is Paying: $35 Spay, $25 Neuter, $12 FVRCP, $13 Rabies, $38 Combo Test - in heat or early pregnancy, no price change. If about 4-6 wks along, could be approx $40 more for abortion. Pick Up between 3:00 – 4:00 p.m.
Pricing: $25 Neuter; $40 Spay (including pregnant or in heat), $10 Rabies, $16 FVRCP, $16 Leukemia, $20 Combo Test.